Today was Israelday. First stop was Yad Vashem, the 2nd biggest tourist attraction in Israel: a holocaust memorial/museum. The museum had the kind of very symbolic architecture I had seen at other holocaust museums. It intends on making you feel a bit claustrophobic and anxious, with a collection of testimonies from people that suffered in the camps, and relics of those that hadn’t survived. I’m having quite a hard time describing how I felt about this place, since it would be an understatement to say this isn’t the first time I’ve seen something about the holocaust. In school we were very informed about everything that happened in the holocaust, we went to deportation camps, museums, and I personally read tons of books on the holocaust on a young age already. It’s hard to describe how the pain and horrors touched me so deeply on an emotional level. So maybe over the years I’ve become a bit desensitized to all of the unforgivable suffering that has been done to a specific population. I didn’t feel anything with this museum. Many of the people in the group had that intense experience, but it really didn’t touch a button with me. It all felt somewhat “seen it, read it”, which is horrible of course. How can suffering become something you find *yawn* repetitive? Have I lost my ability to feel emotions? For some people it worked since they felt it on a deeper level, for me, it started losing its emotional value, and it made me supercynical. How can you talk about this enormous suffering that has been done to the jews, but refuse to talk about what you’re doing to an other population that you are occupying and denying fundamental human rights? I know, it’s cheap to compare the holocaust to the occupation. These feelings were also reflected when we met up with Avraham Burg later in the week. He’s an Israeli writer of the book “the holocaust is over, we must rise from it’s ashes”. It’s about how he feels Israeli society should stop looking back at the holocaust all the time and define their entire existence based on the holocaust. Later on we went to the Hebrew University in Jerusalem. VERY nice campus, Albert Einstein taught there, and cats are chilling everywhere (I want to LIVE there!). There was also no real possibility for a dialogue with Israeli students, which was sad because I really wanted their point of view. Students in Jerusalem really live in the eye of the storm. I did stalk one of them that was giving us a campus tour, but he was alone and we were all kind of bombarding him with question. I think he must’ve been a bit intimidated, although they’re used to people arguing with them over their political view on the conflict. Unfortunately there was only a limited time. The only thing he could really tell was that he also has a life outside the conflict, and doesn’t want his entire life to revolve around the Palestinians. He supports his government, and he’ll criticize them by voting every 4 years. We will meet more Israeli later fortunately! 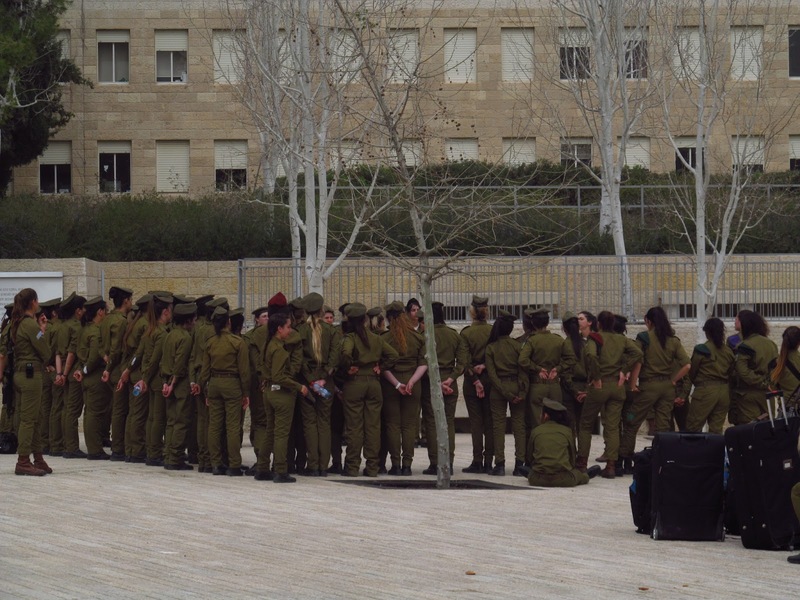 All Israeli are obligated to do military service for 3 years when they turn 18, which does something weird to a society in my opinion… they’re just so incredibly militarized! Luckily there are people that are willing to talk about some of the horrible experiences, and they think society should know. Our soldier gave the example of how they had to block an entire town of 70.000 people from moving around for some weeks after they found out that some guy that had shot at soldiers came from the town. They would barge in with their tanks, shoot in the air, throw grenades and call out in megaphones “this is the IDF, stay in your house, you are not allowed to move around”. When kids would come and harass them, they would shoot them with rubber bullets (which are basically bullets with some rubber around them. It usually doesn’t kill them, but sometimes it does). After a few weeks of terror to the city, they would just get the order to leave again. Anyway, more of that kind of stories you can find on the website. What amazed me the most is that Breaking the Silence is not known AT ALL in Israeli society. Most people that know them, give a lot of critique. The ex-soldiers are seen as traitors and self-hating jews, while they just oppose the occupation of a territory and people and want their country to be a lawful and just country. 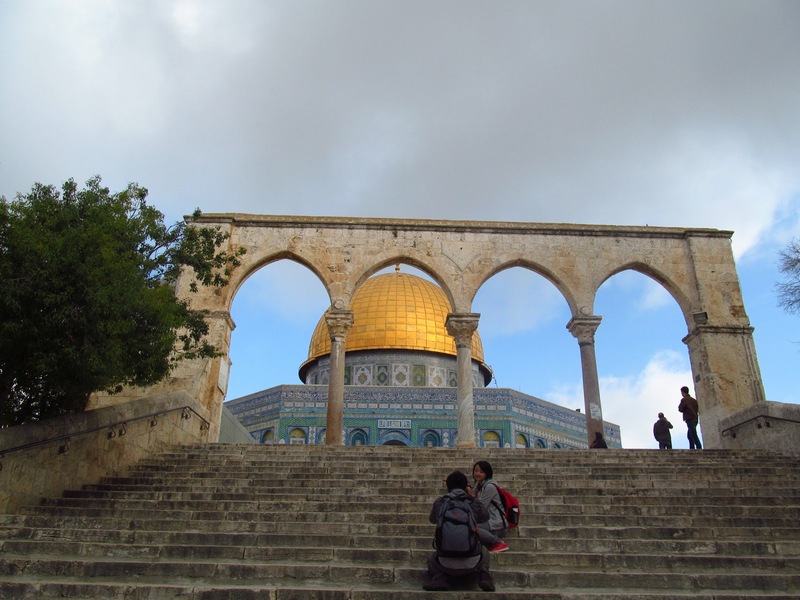 In the last morning in Jerusalem, some of us decided to wake up together with the Muslims (at 4h30 am) to try getting into the Al Aqsa mosque, one of their holiest places. Of course we didn’t (blond, blue eyes, “are you muslim? Give me a verse of the Quran!”) but the mosque opened for tourists at 7h30, so we walked around the Old City for 2 hours. I was a bit cranky at first, but was so happy to see this ancient city wake up, jewish children go to school, the little shops open up, and we got offered a coffee from an arab that had lived in the Netherlands and heard us speak Dutch. When we were able to enter the mosque with the stream of tourists, looking at things through the eye of their camera, babbling away and not giving a care about what they were seeing, I completely understood why we weren’t allowed to enter this place. I could imagine how it had to be without tourists, the sun just coming up and a very special peace overcoming you walking around this spiritual place. Therefore I lost my frustration over having to wake up at 4h30 and not being able to enter; muslims deserve to have their prayer without the clicking sound of the camera’s of a bunch of American tourists in sweatpants and sneakers. 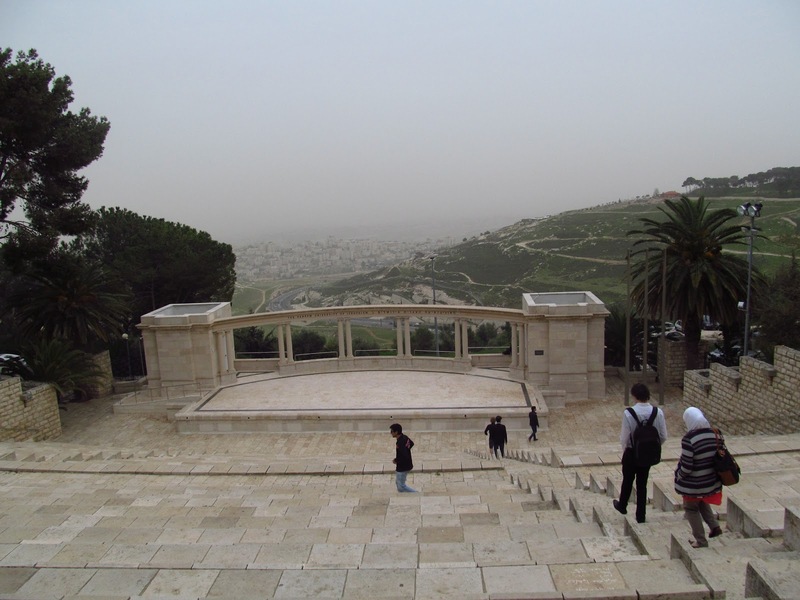 After this we went to the Al Quds University in East Jerusalem (This is in the Palestinian Territories). Unfortunately everyone was on strike that day (the Palestinian Authority had not paid the teachers, and they were also asking for a raise) and the campus was empty, but we had a very enthusiastic political science student giving us a campus tour. He didn’t really talk much about the buildings (thank god! ), but mostly about how he saw the occupation and the situation. He, as the younger generation, had such a moderate and realistic vision on the whole situation that really called for some admiration. I can’t (and will not) go into detail on what he exactly said because it’s always so many ideas and insights that just have a “you had to be there” thing. He was mostly very critical of the Palestinian Authority, and felt like they were a bunch of crooks. He felt that don’t really care about the Palestinians, except out of principle, to annoy the Israeli, who used the PA’s stubbornness to punish Palestinians of course. What really saddened me was that this intelligent young man had traveled the world (he had been to India, Kosovo, Britain,…) but had only ONCE in his 27-year lifetime been able to go to Jerusalem, which would be 5 minutes (!!!) to get there, had there not been a wall. It was just an impossible destination for him. 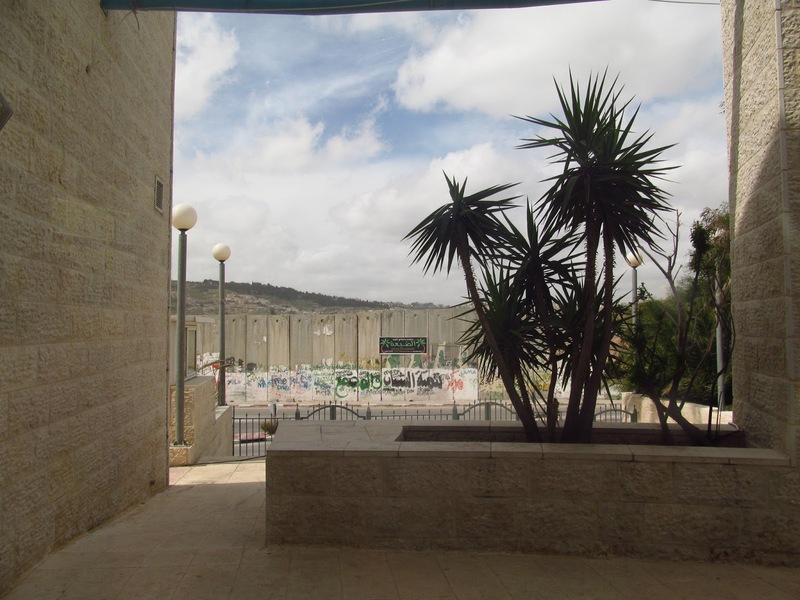 The wall separating him from Jerusalem was very ostensibly right in front of the University. Some thing that really struck me was something they had put on the university campus; a replica of the inside of an Israeli prison, including some information on the torture techniques used on Palestinian prisoners. Unfortunately because of the strike we were not able to go in (since the student didn’t have the key to the building). I was rather cynical; why is this on a university campus…? Apparently they had their own students disappearing everyday and put in the prisons, to be released months later with no explanation on why they were arrested at a checkpoint. Of course we don’t know in how much these students were a “security threat” to Israel and were rightfully arrested (and of course they didn’t tell us). What saddened me a little was the list of all the students that had died in the prisons after such random arrests. Their family never even got a formal apology or explanation on what happened… I can imagine it must hurt, not even knowing WHY. it might be wrong for a university to be so politicized, yet the entire Palestinian life is just so politicized it’s only natural. In the afternoon we went to visit the Tent of Nations. This might be the visit that up until now left the biggest impression on me, and it is very difficult to explain what exactly it did to me but I’ll try to set a picture. The “Tent of Nations” is the farm of the Nassar Family. They have their farm in the C-zone of the Westbank (for those uninformed; after the Oslo Agreements the Westbank was divided in A-zones (under complete Palestinian Authority rule), B-zones (the PA can control civilian life, but Israel controls the security) and C-zones (basically occupied territory by Israel. There is no control of the PA on the territory) these C-zones are also where most of the settlements are erected. Almost all of the Palestinians (which are mostly farmers) that live in C-areas don’t have a proof that the land belongs to them, and are evicted (and settlements are put on their land). The Nassar family fortunately did have a legal proof of ownership (going back all the way to the Ottoman empire) and thus cannot be evicted according to Israeli law. But they have been in a legal battle with the Israeli government since the Oslo agreements (20 years by now), where Israel drains their resources on legal fees over procedural faults and loopholes. Meanwhile they are being COMPLETELY surrounded by settlers. The tent of nations is on a mountaintop, if you just turn 360°, you see 6 settlements in the distance on every surrounding mountaintop, growing towards each other. At the same time their life is made impossible to live where they are. They are cut off from running water and electricity, their farm of olive and fruit trees is regularly burned and cut down by the settlers, roadblocks of big boulders are made on the only road to his house, which made us walk 2km to get to his house/farm. They cannot erect new buildings/constructions or the Israeli come demolish it because they need a permit to build new things (which they do not get of course). Yet this family is the most resilient, creative and optimistic I have ever seen. Instead of making new buildings, they started digging caves which doesn’t need a building permit. With all sorts of innovations they gather their own water and use solar power for electricity, installations sponsored by foreign donors. 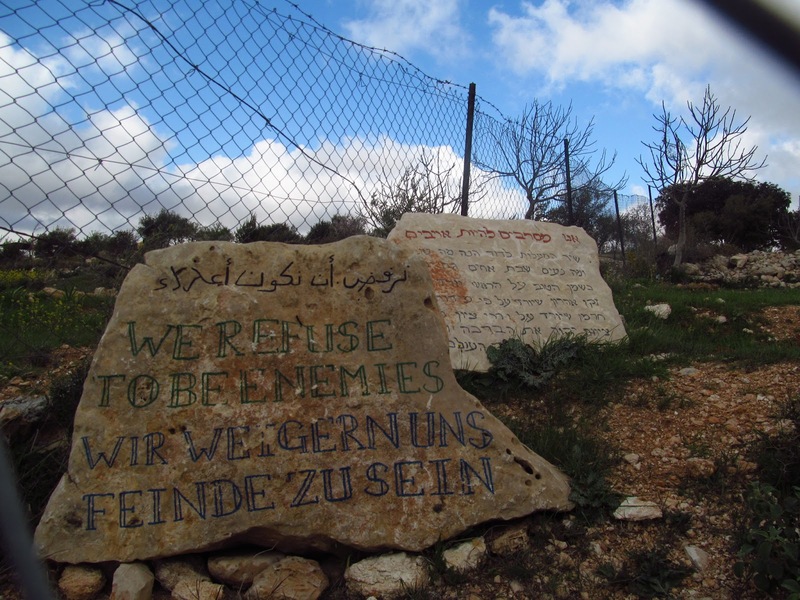 They invite everyone to come visit the farm and possibly volunteer to help out on the land, and they invite even the Israeli’s and the settlers who constantly bully them, since their motto is: we refuse to be enemies. They are a non-violent resistance, which is clearly something Israel does not know how to deal with. Israeli judges don’t want to grant their right to territory because it would set a precedent for other Palestinians that try to keep their territory in C-zones, but they can also not just evict them because they have legal proof that the land is theirs. It would undermine Israel’s already fragile claim of having a rule of law state. They can also not evict them for security reasons as they did with others, because they are as non-violent as can get, unless merely “being Palestinian” is a security threat in itself, which is even more unjustifiable. Anyway, I could write 10 more pages on the Tent of Nations, but I think the message is clear why I felt this was such an inspiring visit. They could set a great example for other Palestinians. Non-violent resistance is possible even though it’s hard, and it freaks Israel out. Their spirit and their reluctance to give up is very inspirational. That evening we moved to a new hotel in Bethlehem (Westbank) where we would stay for the next 3 nights.